With changing times, most employees seek to have a better blend of work and life. No one wants to be chained to the desk all day. Instead, people want a life which is flexible and fulfilling. If you are offered a job which doesn’t have these policies, ask for it and make them understand that they should accommodate such options. 1. Flexible work schedule – One of the best non-financial perks you can get is a flexible working schedule. Everyone is productive at different times – some people can wake up as early as 5 am and get work done whereas some tend to be more productive after 11 am. If you are one of those people who find it hard to stick to a 9-5 schedule, talk to your employer and see if they are willing to offer flexible work schedules. 2. Teleworking/ work from home options – In today’s day and age, you do not necessarily have to be physically present in the office to get work done. Work from home and teleworking offer both, freedom and flexibility when needed. Of course, this would not be an ideal full-time working solution. However, part-time work can get the job done. Apart from the relaxed schedule, you can also save on travelling expenses and will be able to spend more time with your family, which is quite a boon! 3. Professional development – Not many give this a lot of thought, but it is an essential part of your career. Certifications, classes, conferences, etc. are all forms of professional development. Although your employer might have to shell out a little more money, it could be immensely beneficial to you in the long run. This perk exposes you to new work developments and gives you some additional experience, which can boost your resume at no cost. An added bonus – you employer will equally benefit from your skills and certificates. 4. Reimbursement of transportation expenses – Commuting is not cheap. Plus, if you travel out of town and use other modes of transportation, the overall costs will go through the roof! To help ease this expense, calculate your monthly travel costs and ask for a stipend. Some companies also offer Leave Travel Allowance (LTA), which reimburses employees for their personal travel expenses when taking leave. The amount paid as LTA is exempted from tax. However, this perk is only applicable for travel within the country and on actual travel costs (flight, train tickets etc. and not on food, accommodation or sightseeing). 5. Additional vacation time – Your company might allow 7-10 days of paid vacation every year. Getting a few extra days of leave to kick back and relax will help you clear your head and boost your morale! After all, who doesn’t like taking time off?! 6. Performance bonus – Receiving a bonus at the end of the year for your performance is motivating. Based on your performance and the company’s overall performance, you could be granted a bonus. A high salary is something we all want. 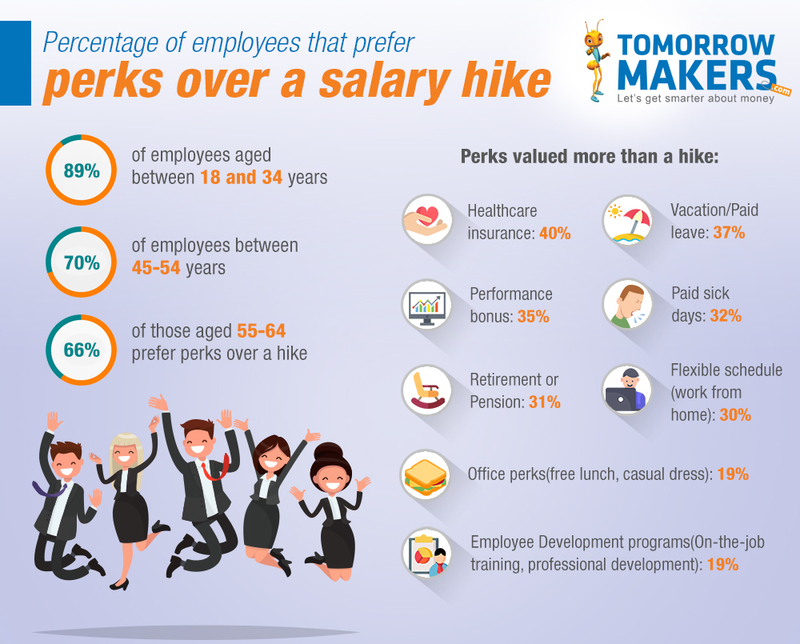 But perks like this will help you work longer, be more productive and deliver effective results. Another motivating factor for employees is a health insurance coverage offered by companies. Depending on the company, you could either get an individual or group health insurance, for you and your family. Regular health check-ups, hospitalisation expenses, medical expenses, etc. are also sometimes taken care by companies. This perk goes a long way in showing individuals that their employers care about them and their well-being. 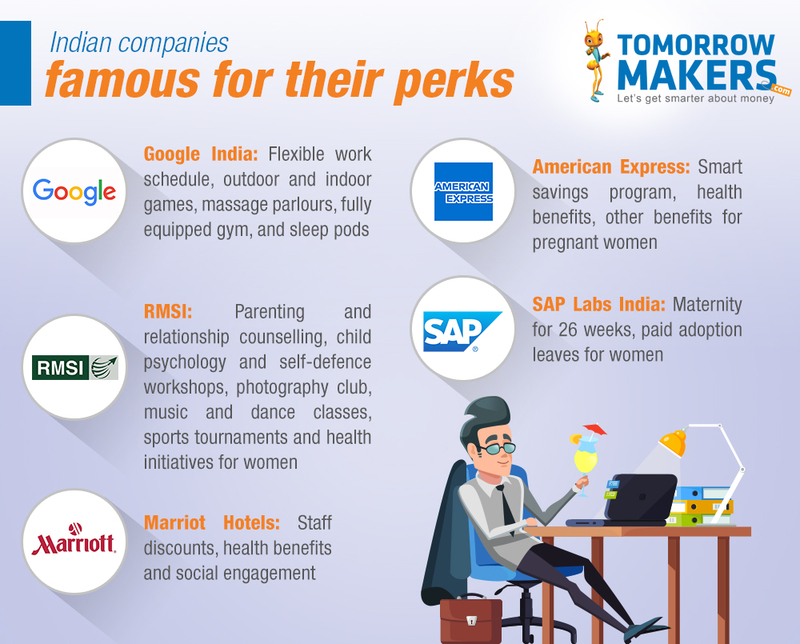 Apart from these, there are many other benefits an employee can get from his or her organisation such as fun-Fridays to daycare for children etc. While these may not be monetary perks, they do bring some quality and ease to your life and makes it just a bit more comfortable.